Sunday 20 I am the only Captain for duty in our regiment. Dr Hicks feels very bad this morning on account of the death of his son which took place in our regimental hospital last night. I was relieved from duty, but received notice that I would be division officer of the day tomorrow, so I am on duty every day. Had preaching this evening. Monday 21 Reported to General Asboth this morning. General Tuttle is here and will again assume command of our division, general Asboth goes to New Orleans. I was late visiting our pickets, came very near being lost in the woods. Tuesday 22. 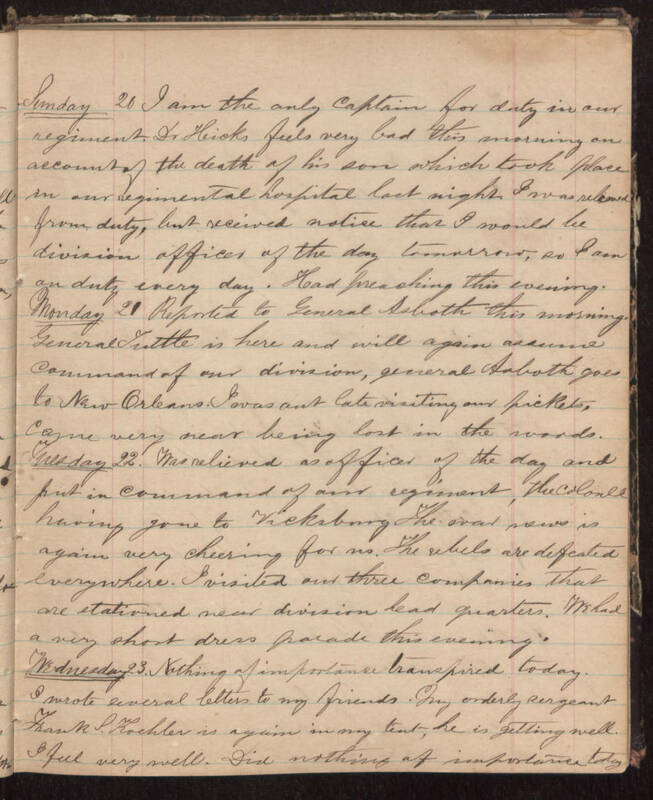 Was relieved as officer of the day and put in command of our regiment, the Colonel having gone to Vicksburg. The war news is again very cheering for us. The rebels are defeated everywhere. I visited our three companies that are stationed near division head quarters. We had a very short dress parade this evening. Wednesday 23. Nothing of importance transpired today. I wrote several letters to my friends. My orderly sergeant Frank S. Koehler is again in my tent, he is getting well. I feel very well. Did nothing of importance today.